I still have a ton of blueberries left so I thought I’d bake a Blueberry Buckle. In case you don’t know what a buckle is, it is a single layer cake, very dense, made with berries in the batter and streusel type toppings –similar to a coffee cake. While blueberry buckle is the classic version, you can make this with any seasonal fruit. When the cake bakes, the batter rises encasing the fruit, which causes the streusel topping to “buckle” giving it a crumbled look (source: wiseGEEK). 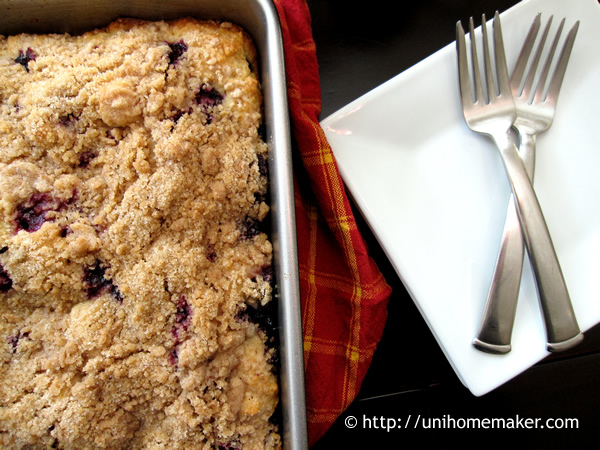 So if you like coffee cake and blueberries, this is a good one to make.